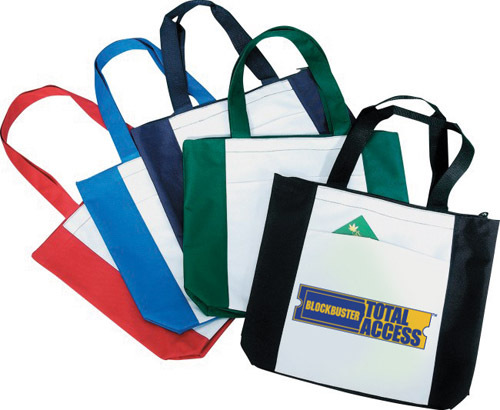 The Poly Zipper Tote is a great promotional product to impress your clients. This item measures 16½ inches x 14 inches x 4 inches and is made out of a durable 600 denier polyester material. The tote is equipped with vinyl backing, zipper top, gusset and 24 inch handles to make for easy transportation and many color choices. Great for groceries or everyday shopping! 16½" x 14" x 4"
Colors: Royal/White, Red/White, Black/White, Navy/White, Green/White. Standard Imprint Area: 8" x 7"